Islay’s Bowmore distillery has launched three new single malts as part of its new Vintner’s Trilogy, each focusing on a different wine finish. Launching globally from September, the trilogy features whisky matured in the distillery’s No 1 Vaults, and finished in manzanilla Sherry, wine and Port casks. Bowmore 18 Year Old Manzanilla Cask has been aged in ex-Bourbon barrels for 13 years before finished in ex-manzanilla Sherry casks for a further five years. The release, which is bottled at 52.5% abv, is said to contain notes of blackcurrants, fudge and Seville oranges, with a ‘burst of peat smoke’. Bowmore 26 Year Old French Oak Barrique has also been aged for 13 years in ex-Bourbon barrels before spending an additional 13 years in wine barriques. Said to have notes of dark chocolate, tropical fruits and smoke, the expression is bottled at 48.7% abv. Finally, Bowmore 27 Year Old Port Cask, which is matured in ex-Bourbon barrels and finished in Port pipes, will be bottled at 48.3% abv for release in 2018. 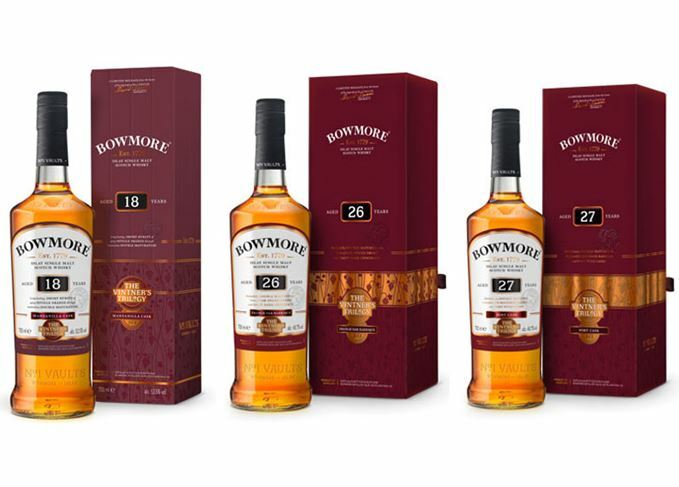 Bowmore 18 will be available for £105 (US$127/€110), and Bowmore 26 for £400 (US$540/€420) at specialist retailers globally. The final Vintner’s Trilogy single malt has spent more than half its life in a Port pipe.